I stood on the sand as the children ran into the ocean on a Saturday afternoon. Every one of them had a huge smile. The boys tackled one another and splashed water over the girls. Penny Fairo, executive director of the Greta Home and Academy in Haiti where the kids live, jumped in and joined them. They climbed on her back as she waded through the waves while laughing. They all had just been baptized, confirming their faith in Jesus Christ. 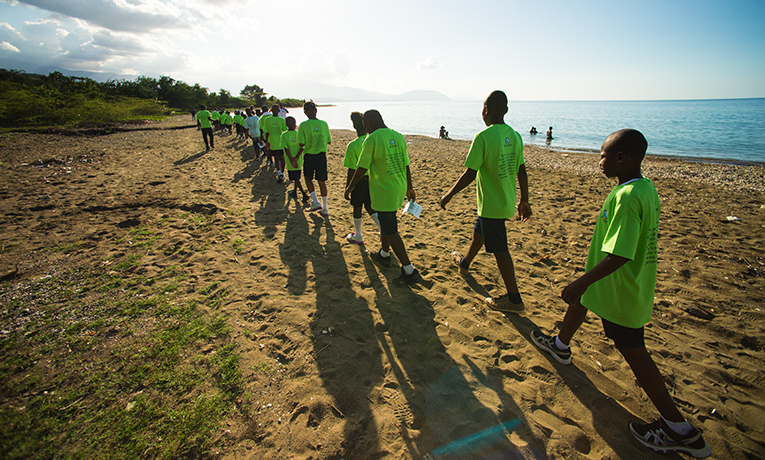 It was a moment of pure joy and excitement, and it wasn’t every day that these orphaned and abandoned boys and girls got to enjoy a day at the beach. Their lives had been marked with hardship, even before the earthquake of 2010 destroyed their homes. Many of the children were living in poverty before the disaster. The economic conditions of Haiti leave many fathers and mothers without jobs, education, or the means to provide for their kids. Most of the boys and girls’ parents are still living, but simply can’t afford to care for them. Without a father or mother present in their lives, you’d think that these children would be depressed or angry. But in reality, their lives at the Greta Home and Academy are far better than anything they could experience elsewhere. They have everything they need—three meals a day, a quality education, warm beds, and “mommas and papas,” their caretakers, to watch over them and give them plenty of hugs and kisses. Not only that, but they have hope in God, that He will give them new lives and a promising future. I was amazed at how much faith and trust the 39 children who were baptized have in God. At such a young age, they see and know the truth, and it’s giving them the strength they need to grow up and confront the harsh realities of life. Valeze is one of the older boys who is leading by example. When I talked to him I could see his incredible fortitude and conviction to do the right thing, to follow Christ with abandon. He leads devotions and encouraged some of the other children to get baptized. One of the younger girls, Love Mailie, spoke with me as a scholar, remembering everything she learned about the importance of baptism. I could tell that she truly had faith like a child. There was no doubtful wavering in her voice whatsoever. But where does this conviction come from? I believe it’s from recognizing the love God has for them. Even though they don’t have fathers or mothers present in their lives, our staff is loving them unconditionally, treating them as if they were their own kids. In experiencing this compassion, they have experienced the love of God. We are not forcing them to believe in Jesus. This is a personal choice they have made based on what they have witnessed, experienced, and learned. I am encouraged that these children are the future of Haiti. They are bright, full of conviction, perseverance, and strength. They have endured so much, and despite their circumstances, are looking ahead with high hopes. When I walk into the Greta Home, I am greeted with hugs, smiles, and laughter. I know that it’s only the love of God that could truly change the heart of an orphaned child.